Cuba is known for cars, cigars, communism and…chess? HAVANA – Though little-known to many in the world, chess is one of Cuba’s greatest prides. The game is considered to be a blend of sports, arts and science among players and is deeply embedded in Cuban history and culture. Among chess circles worldwide, Cuba is known for producing one of the greatest chess grandmasters of all time—José Raúl Capablanca, whose influence led generations of Cubans to study chess in school and become internationally-ranked chess players. “Cubans like chess and we had a world champion—Capablanca—and any country that has a champion has to seek the steps of their champion,” says Ramòn Pastor Hernàndez Somè, a professor of chess here in Havana. Even Fidel Castro, the country’s longtime leader, played chess and promoted it along with his nationwide literacy programs. Castro and his right-hand-man Che Guevara organized the Chess Olympiads in 1966 and the world’s largest simultaneous game of chess in 2002. Since 2002, chess lessons have aired weekly on national television. Today, some of the world’s top chess players, men and women, live in Cuba. Pablo Salcedo Mederos is one of Cuba’s top players. The 63-year-old is a five-time Cuban national champion with an ELO rating of 2,380 (four points fewer than when I spoke to him in February). He currently holds the title of a senior international master, just one title away from chess’s highest distinction of grandmaster. Despite chess’s prominence in modern Cuban culture and the one-party communist government’s support for chess education, chess in Cuba isn’t what it once was—or could be. The worldwide chess community has embraced the internet for play but for Cubans, connecting to the internet is difficult. Internet access is limited to Wi-Fi hotspots and expensive for the average Cuban. Some Cubans worry their skills will suffer and interest in the game will decline. Still, Salcedo has hope for chess’ role in Cuba’s national consciousness. “We are a people who fight,” he says. To that end, he is organizing a free internet tournament in April to memorialize the great Capablanca, inviting players from all over the world to participate in the event virtually. It’s a way to honor the godfather of Cuban chess and ensure his legacy — chess in Cuba — is honored. “Chess is part of the national identity,” says Danilo Buela Valdesfino, director of the Latin American Institute for Chess (ISLA), which teaches children how to play. Christopher Columbus brought chess to the island in the 15th century. But Carlos Manuel de Céspedes, the man most famous for declaring Cuban independence in 1868 — which started a war — is considered to be the father of the country in chess circles because he translated the rules and regulations of chess, says Buela. The way Cubans think of chess today is most closely associated with José Raúl Capablanca, a legendary grandmaster from the 1920s. He is considered one of the greatest players of all time by the worldwide chess community, and the greatest Cuban player in history. In 1921, Capablanca won the World Chess Championship in Havana, becoming a national hero and solidifying the game’s reputation on the island. “Chess is popular because chess was inherited by Capablanca,” Buela says. After Capablanca died in 1942, chess aficionados created the Capablanca Memorial chess tournament in his honor. The first tournament after the 1959 revolution that brought Castro to power was in 1962 at the Habana Libre Hotel, the finest in Havana. It was funded by Che Guevara, the Argentine revolutionary and director of the National Bank. Fidel Castro vs. Filiberto Terrazas, in Havana, 1966. This was not the last time the government promoted chess. 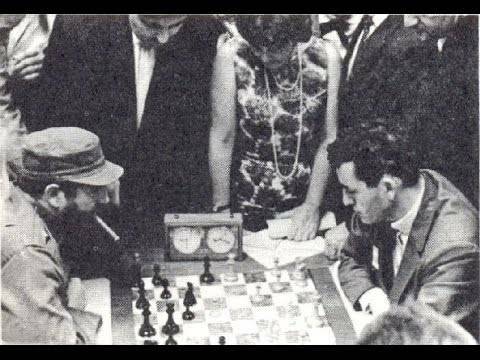 When Cuba sponsored the 1966 Chess Olympiad, the authorities worked to attract the world’s attention. Cuba provided each of the 58 participating countries’ teams with a chauffeur, car and paid air travel, and spent an estimated $5 million on the event. Castro himself participated, playing and losing against the American chess player Bobby Fischer, who was barred by the U.S. government from attending the Capablanca Memorial the year before (though he played virtually by telex). Bobby Fischer vs. Fidel Castro, in Havana, 1966. In December 2002, Castro led another chess exhibition in Jose Marti Square in Havana. This time, it made the Guinness World Book of Records for the largest chess simultaneous match ever, with 11,320 players. The success of the event led to the broadcasting chess lessons on TV. When the Cuban government promoted a “campaign of literacy” to educate the masses in Cuba after the revolution, the goal was to provide free education to every citizen. Around the time of the 1966 Chess Olympiads, an idea was born: chess would be taught to all children. “Where the entire nation learns to read and write and has access for free to the sport. So, then Che — who was an aficionado, who was very important to the game of chess –promoted a program for the masses due to the campaign of literacy,” says Buela. According to Salcedo, Castro borrowed this idea from Capablanca, who believed it was important for children to learn chess in school. And it was Guevara, Buela says, who really pushed for chess education in schools. If the idea was inspired, the execution fell short. Finding good teachers for young chess players became imperative as the government pushed for more chess education, particularly when it strengthened relations with the Soviet Union. (In the Soviet Union and now in Russia, chess is a popular and important game.) In the 1980s, the government created the Latin American Higher Institute of Chess, more commonly referred to as ISLA. Located in the Vedado neighborhood of Havana, ISLA offers free chess lessons in the hopes of creating the next generation of grandmasters. Ramòn Pastor Hernàndez Somè is a professor, coach and teacher at ISLA. He learned how to play chess from his father—without a formal teacher—and is committed to teaching chess to Havana’s youth. “I don’t want these children to have what happened to me. So, any child that has interest or urge or want to be here, I permit them to be here,” he says. “It helps with memory and board strategy. It allows for creative expression, the logical forms of thinking and also allows for the development of volunteering and many, many other things,” he says. “It’s a game that is aesthetically beautiful because of its artistic expression. And like all sports, motivates triumph,” says Pastor. Salcedo was too old to learn chess at ISLA or even in his primary school. He learned from a friend’s father how to play the game. As an adult, on the civil engineering faculty at the university, his devotion to teaching chess was born of sadness and loss. “In 2006, my wife died of cancer and my son — my little son — emigrated to the U.S.A. And I was alone,” Salcedo says. So, he asked if he could teach chess at the university, and he did from 2008 until he retired in 2016. He was also one of the teachers who taught chess to the masses on Cuban television. For free, he says. Many chess teachers in Cuba — including those at ISLA — volunteer their time to do so. 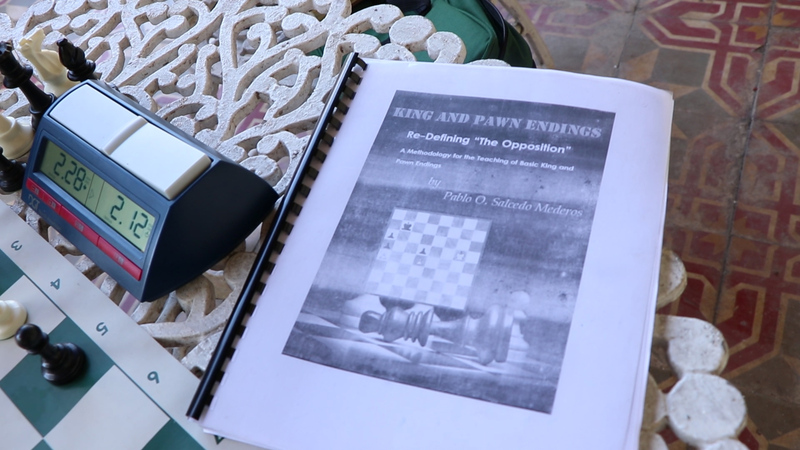 Salcedo wrote a book about chess in English, “King and Pawn Endings Re-Defining “The Opposition”: A Methodology for the Teaching of Basic King and Pawn Endings.” One of his students printed his manuscript for him and bound it together for him as a gift to show his gratefulness to Salcedo. Cubans play chess on sidewalks, at school, in city parks and at the foot of crumbling buildings. Boards, pieces and timers are considered luxuries by many Cubans. Some chess fans improvise by playing correspondence chess, which once meant playing chess through the mail. The price was right, according to Salcedo, but he found the Cuban postal system less than reliable. Correspondence chess through the post was once very popular. 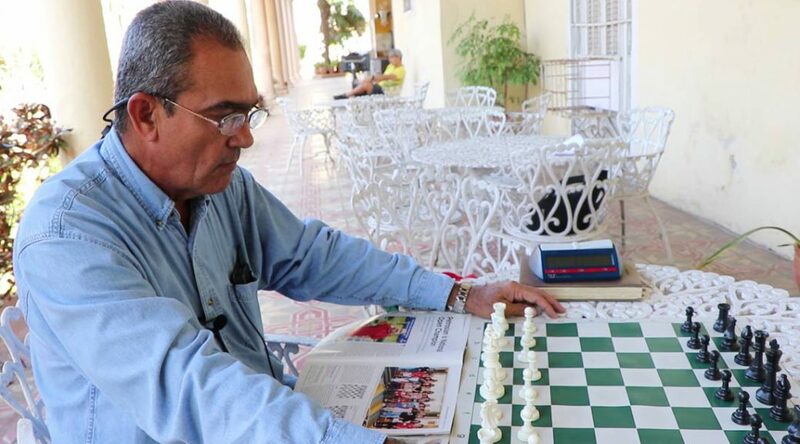 In fact, Salcedo is the president of the International Correspondence Chess Federation in Cuba, which attracted players to compete with people from around the world. Why? The simple and biggest answer is the internet. While the world chess community adopted the internet as a means of playing correspondence chess years ago, online chess in Cuba is challenging. For one, internet in Cuba is hard to come by. Cuba’s National Statistics Office claims that 4.5 million users accessed Cuba’s internet in 2016, representing about 40 percent of the country’s population. Home internet connections are only available in 5 percent of homes, typically belonging to doctors, professors and state media professionals. Until last year, most home internet connections were illegal until the government announced a pilot program to install internet in 2,000 homes across selected neighborhoods in Old Havana and provincial capitals. But it’s unclear if everyday Cubans can afford to pay for the internet. Mobile internet does not yet exist in Cuba, so Cubans must visit local Wi-Fi hotspots at parks to go online by purchasing one-hour user cards for approximately 1 CUC, Cuba’s convertible currency, or about $1 for an hour’s connection. One dollar may not seem like much to foreigners and tourists, but that adds up when you consider the average Cuban makes $30 per month. When it comes to teaching the next generation of students, teachers at ISLA know the internet will become important to a child’s education, including their education with chess. But for now, the internet is costly and cumbersome. For Salcedo, the internet is a blessing, because he can head over to the local internet hotspot, log on to ICCF and play 18 games simultaneously online. In the past, he’s played 200 games at once. But even for him, it’s a curse because of the cost. Retired from the university, he collects $16 a month from the government. “You cannot eat with 16 CUC ($16). You need money from another place,” he says. Salcedo relies on money sent from the U.S. to pay his phone and internet costs, not to mention money for food and travel. When he isn’t online, Salcedo travels abroad to play—in England, Italy, France, Germany, India, Ethiopia, El Salvador. He knows that there are more possibilities to play in other countries, but that cost, too, is expensive. A tourist visa to the United States costs $160—10 times his monthly salary. His family abroad sponsors his trips. Besides, international tournaments are expensive and Cubans must foot the bill themselves. That’s why Salcedo is organizing a free chess tournament in April, attracting international players from the U.S. and Russia to play online for a Capablanca memorial tournament. Players log into ICCF when the tournament starts April 15, and there is no end date in sight. Salcedo doesn’t get paid for organizing the tournament or being president of the ICCF’s Cuba chapter or appearing on television—nor will he charge for it. He just loves chess and wants to see it thrive in Cuba.